C#, through the .NET Framework common language runtime (CLR), automatically releases the memory used to store objects that are no longer required. The release of memory is non-deterministic; memory is released whenever the CLR decides to perform garbage collection. However, it is usually best to release limited resources such as file handles and network connections as quickly as possible. The using statement allows the programmer to specify when objects that use resources should release them. The object provided to the using statement must implement theIDisposable interface. This interface provides the Dispose method, which should release the object’s resources. A using statement can be exited either when the end of the using statement is reached or if an exception is thrown and control leaves the statement block before the end of the statement. It is always recommended to use Dispose method to clean unmanaged resources. You should not implement the Finalize method until it is extremely necessary. At runtime C#, C++ destructors are automatically Converted to Finalize method. But in VB.NET you need to override Finalize method, since it does not support destructor. You should not implement a Finalize method for managed objects, because the garbage collector cleans up managed resources automatically. 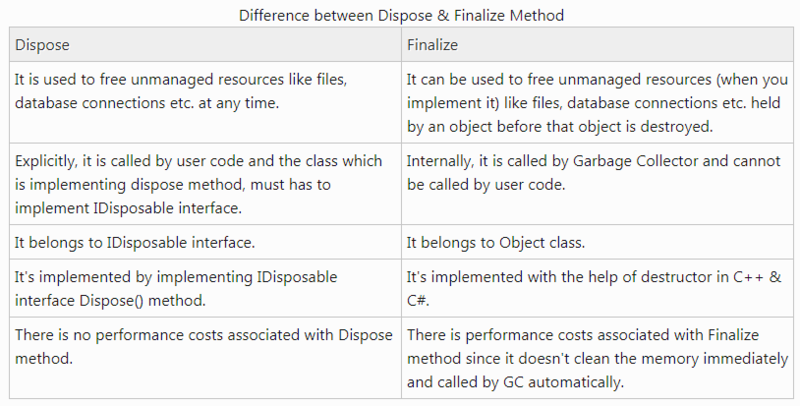 A Dispose method should call the GC.SuppressFinalize() method for the object of a class which has destructor because it has already done the work to clean up the object, then it is not necessary for the garbage collector to call the object’s Finalize method.